In December 2000, Californians suffered a rare ordeal: rolling blackouts in a cool month instead of the blackouts seen intermittently in summer because of heavy air conditioning use overtaxing the state’s energy grid. The Golden State’s struggle to keep the lights on in winter 2000-01 produced a political crisis for Gov. Gray Davis. His response was signing a long-term deal in March 2001 with out-of-state suppliers that committed the state to spend $43 billion for power at the rate of 8 cents per kilowatt hour. Economists instantly criticized the deal as unnecessarily costly and lengthy — an overreaction to unusual circumstances. This ended up proving conventional wisdom and was a contributing factor to the public anger with Davis that led to his October 2003 recall election. In a few years time, will the conventional wisdom about another bold state energy policy — the huge long-term commitment to massive alternative-energy plants — be similarly negative? Given how rapidly the solar-energy picture is changing, it seems quite possible. ‘Obsolence’ for traditional electric utilities? The world’s largest solar-power plant, the 550-megawatt Desert Sunlight project, opened in February near Joshua Tree National Park. Three even bigger projects have won approval from state regulators and are progressing toward completion, as well as several smaller plants. 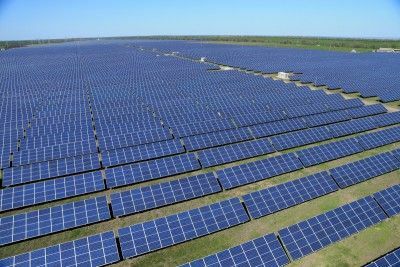 But these industrial solar projects might not even be needed if the “distributed solar” boom, in which homes and businesses generate power with their own panels, continues. As the cost of photovoltaic panels comes down — they’re now 60 percent cheaper than in 2010 — reliance on utilities for electricity keeps dropping. And if Tesla’s promised breakthrough on home batteries to store surplus energy comes to pass, the basics of electricity will change in much of America. Utilities would face enormous problems paying off their long-term sunken costs. Most of the coverage of utilities’ opposition to distributed solar has focused on their criticism of requirements that they buy surplus power from individual homes or businesses at favorable rates that don’t help utilities pay for the cost of maintaining their energy transmission grids. The Post article noted that utilities were making relatively little progress in encouraging state legislatures to obstruct rooftop solar’s rise but some progress in getting utility regulators to accept their agenda of self-preservation. 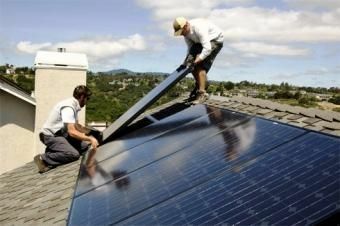 In California, however, rooftop-solar advocates are so powerful that it seems extremely unlikely that the Public Utilities Commission would impose fees and surtaxes on rooftop solar, as regulators have done in Arizona and Wisconsin. On the other hand, the PUC has shown deep concern for helping investor-owned utilities keep a healthy bottom line. The shuttering of the San Onofre nuclear power is going to cost $4.7 billion. But PUC officials secretly negotiated a deal in which San Onofre’s majority owner (Edison International) and its minority owner (San Diego Gas & Electric) must only pay $1.4 billion — with the utilities’ ratepayers picking up the remaining $3.3 billion in coming years. This has rankled ratepayers and watchdogs alike, since a case can be made that better management at San Onofre would have identified the problems with defective Mitsubishi steam generators at the plant that led to its closure. The PUC could in coming years face similar questions of how to divvy up the multibillion-dollar costs of the construction of giant solar plants in the state’s southeast corner — if they are no longer needed to operate at full capacity, or at all. That could be a thornier question for the PUC than San Onofre, however. Edison, SDG&E and Pacific Gas & Electric could say they committed to the massive solar plants under legal and political pressure because of laws like AB32 and ardently green governors like Arnold Schwarzenegger and Jerry Brown. That pressure — and how it was applied with PUC dictates — could end up being another chapter in the yet-to-be-written biography of Michael Peevey, whose 2002-2014 stint as president of the commission ended in a maze of controversies over his close ties to utilities.